On the morning of July 30, 2012, an accountant named Michel Gauvreau arrived at the Global Strategic Maple Syrup Reserve, housed in a huge red brick warehouse on the side of the Trans-Canadian Highway in Saint-Louis-de-Blandford, about two hours northeast of Montreal. Inside, baby-blue barrels of maple syrup were stacked six high in rows hundreds deep. Full, each barrel weighs about 620 pounds. With grade A syrup trading at about $32 per gallon, that adds up to $1,800 a barrel, approximately 13 times the price of crude oil. The fiscal year was coming to a close, and the Federation of Québec Maple Syrup Producers had hired Gauvreau's company, Veragrimar, to audit its inventory. Québec dominates the maple syrup market, and since 2002 the Federation has operated as a legal cartel, setting production quotas and prices, authorizing buyers, and stockpiling syrup. There were around 16,000 barrels here, about one-tenth of Québec's annual production. The gap between the rows was barely wide enough to walk through, and the rubber soles of Gauvreau's steel-tip boots stuck to the sugar-coated concrete floor. He scaled a row of barrels and was nearing the top of the stack when one of them rocked with his weight. He nearly fell. Regaining his balance, he rattled the barrel: It was light because it was empty. He soon found others that were empty. After notifying the Federation's leaders and returning with them to examine the stockpile, they unscrewed the cap on a full barrel. The liquid inside was not goopy, brown, or redolent with the wintry scent of vanilla, caramel, and childhood; it was thin, clear, and odorless. It was water. The Federation would need two months to tally the losses to the stockpile. 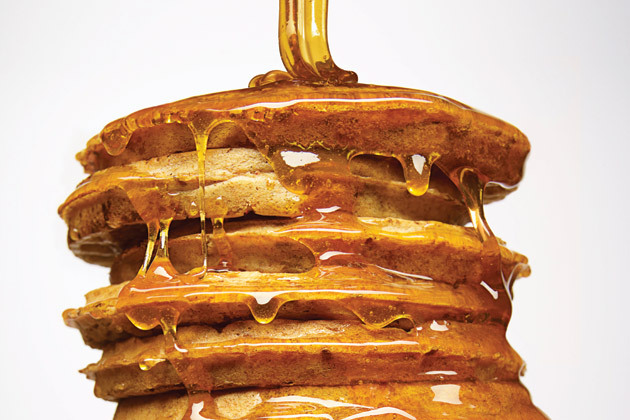 Sixty percent, or 6 million pounds of syrup, had vanished, worth about $18 million wholesale. The bold and baffling heist counts as one of the largest agricultural thefts ever, dwarfing the 860 head of cattle snatched in Queensland, Australia, last spring and the potato patches the size of a football field that were dug up in British Columbia in August. Siphoning off and transporting so much syrup was no mean feat. It would have taken more than 100 tractor-trailers. "To steal that amount of maple syrup means you have to know the market," says Simon Trépanier, acting director of the Federation. "We are talking about big players." See the Bloomberg video on the inside story. The theft was also an existential threat to the Federation, which had viewed its growing strategic reserves as the final step in stabilizing prices, locking in buyers, and ensuring loyalty from its producers. For the past decade it had struggled to overcome opposition to its reign in a series of legal battles the local media had christened "The Maple Wars." Some observers have suggested that their attempts to control the syrup supply had, in fact, catalyzed an underground economy. "With the benefit of hindsight, this is something you would have expected," says Marc Van Audenrode, an economist with the Analysis Group in Montreal, who has studied the industry. Indeed, the syrup trail soon led to free-market renegades inside and outside the province who opposed what was, in their view, a Communist program. It wasn't just about syrup, or money. It was a miniature Canadian Cold War. Maple syrup may not rank among Canada's most financially important agricultural exports, but nothing says "Eh!" quite like a liter of boiled-down tree sap. Ten species of maple, including the sugar maple, are native to Canada. By the early 19th century the multipointed leaf had become a popular icon for French-Canadians living in the Saint-Lawrence Valley; it wasn't long before the leaf became a national symbol featured on coins, military uniforms, and eventually the country's flag. When Prime Minister Stephen Harper travels abroad, his gift bag for foreign leaders includes a selection of the country's finest maple syrup. It remains both a national point of pride and a durable punch line. At Canadian markets, you can find maple sugar, maple butter, maple pork rub, maple vinaigrette, maple coffee, maple tea, and, as of last year, maple perfume. Syrup production occurs between February and April, on the 20 to 25 days when the temperature rises above freezing, creating pressure that forces the energy-rich sap--which is about 3 percent sugar--out of a tap hole in the trunks of maple trees. On a recent morning, Philippe Turcotte, 39, an affable man with a speckling of gray in his goatee and mustache, took an ATV tour of his family's 12,000-tree sugarbush in Drummondville, Québec. A tangle of plastic tubes stretches from tree to tree, converging on a vacuum pump in a wooden shack at the back of their property. From that shack, the thin sap gets pumped about half a mile over the hill to a barn, where reverse-osmosis raises sugar concentration to 14 percent. Then Turcotte fires up his $25,000 stainless steel Dallaire evaporator--model name: L'Enfer ("Hell")--and boils the syrup until it reaches a sugar concentration of exactly 66 percent. For 2012, Québec estimated maple syrup production of 96.1 million pounds, which has a wholesale value of about $270 million. Approximately two-thirds of bulk exports head to the U.S., with the rest going to Japan, Germany, France, the U.K., and other countries. For most producers, maple syrup is either a hobby, a second career, or a source of retirement income, but their investment and revenue are not trivial. Turcotte's sugarbush can produce 35,000 pounds of syrup each year, worth about $100,000, but it's going to be many years before he pays off his equipment improvements. Turcotte, who also works for the telecommunications company Bell Canada (BCE), says he would not be where he is today were it not for the Federation. "They took this industry out of the backwoods," he says. "For myself, business has never flourished so much." Early on, maple syrup producers banded together in this region to form trade groups and develop joint marketing plans. In 1989 the Agriculture and Food Marketing Board in Québec, which sets regulations and arbitrates legal disputes, oversaw a vote that empowered the Federation alone to set the rules for the production and marketing of maple syrup throughout the province. Over the next 10 years, the number of tapped trees increased from 20 million to 35 million. The short production season often resulted in price fluctuations, and by 2000 supply had also outpaced demand: Syrup prices fell to C$1.56 ($1.57) per pound from C$2.20 in 1998. Producers were unable to get bank loans or invest in new equipment. In 2002 and 2003 the Federation created a central sales agency and a quota system for bulk sales. Producers obtained their quota based on their two best production years. The rules have nudged the wholesale price up from an average of C$2.06 per pound in 2002 to C$2.82 today, but the province's 7,300 producers also have to pay their dues: C12¢ per pound sold. For the 20th anniversary of the cartel, in 2010, the Federation's enthusiastic young inspector, Mathieu Audy, penned an ode: "With the principles of unity, solidarity, and social justice, producers have pursued their common interest and traveled the countryside in search of consensus!" It sounds better in French. Solidarity to some, however, is devilish centralized planning to others. If you live in Québec and want to tap a maple tree to sell syrup wholesale, you either have to buy land from someone who has been granted an allocation or apply for a new allocation from the Federation, an uncertain process that could take years. Twelve hundred producers are on the waiting list. Producers are free to exceed their quota, but they'd only get paid once the Federation's entire inventory was exhausted. They're also on the hook for storage fees. The quota also calls for intrusive oversight at times. For instance, if a producer fails to sell to the Federation one year, Audy or his peers could ask him to provide electricity bills to prove he wasn't boiling syrup. Buyers and producers caught circumventing the system are hit with hefty fines. "We have a rotten system in Québec," gripes Roland Champagne, a producer in Inverness. In the woods, a rebellion started. Nevertheless, by the summer of 2012, the Federation had largely prevailed over its malcontents and was nearing a milestone that would cement its dominance. To fully stabilize prices, actuaries calculated that the Federation needed to maintain reserves of 40 million pounds of syrup, and the Federation was building a facility to accommodate that. Meantime, it had begun stashing its surplus syrup at a rented warehouse in Saint-Louis-de-Blandford. The only security was a guard who was supposed to stop by each day. Etienne St. Pierre, a 69-year-old widower, has lived his entire life in Kedgwick, New Brunswick, a working-class logging town 100 miles from Maine surrounded by mixed evergreen forest in the northernmost remnants of the Appalachian Mountains. His great-grandfather settled here in 1905 as part of a land grant program; today, his four brothers and two sisters all have houses along one short stretch of Route 17. After retiring as a mechanic in the early 1990s, St. Pierre started a sugar farm producing about 65,000 pounds of syrup each year and selling it to Québec. But for three straight years, from 1993 to 1995, he lost about half of his sales as one buyer after another declared bankruptcy. He decided that if anything went wrong, he'd rather be the one declaring bankruptcy. He sold his sugarbush to his only son and set up shop in an office attached to his home, launching SK Export in 2002 to package and ship syrup. His business plan was simple: Avoid the Federation and sell directly to distributors in the U.S. In the first year he exported thousands of barrels of New Brunswick syrup to Maple Grove Farms of Vermont, whose syrups, candies, and baking mixes sell at Wal-Mart Stores (WMT), Safeway (SWY), and other chains. In 2006 he sent advertisements to producers in Québec, promising 25 percent to 50 percent cash. "Our system is very confidential," one flyer noted. "St. Pierre is a very honest person and very well known in the region," said another. St. Pierre's opinion is that Québec's provincial rules don't apply to him. "As soon as you cross into New Brunswick, the Federation can do nothing. There's no border. No duty," he says. The Federation begged to differ. On April 17 an undercover investigator working for the Federation--and operating under the dashing alias Jacques Leblond--phoned St. Pierre, asking if he'd buy four barrels of Québec syrup. Mais oui, said St. Pierre. The next day, Leblond's partner drove four barrels from the stockpile to New Brunswick. St. Pierre graded his syrup and assigned Leblond a confidential number, 95, by which he would be identified. One month later, Leblond received a check for C$3,550.65 made out to Buyer 95. That was less than the Federation would have paid, but the payment came promptly. The Federation expanded the investigation the following year, discovering more about St. Pierre's trade network. Québec producers were shipping thousands of barrels of syrup to St. Pierre via a remote farm, where the owner earned a dime for every pound it stored. One couple, Jean-Pierre and Lise Caron, ignored the quota system and sold St. Pierre their entire annual production in 2005 and 2006. The Federation demanded that St. Pierre pay C$264,166 in damages and submit all his bank statements from 2004 to 2008. St. Pierre, a mellow man who dons a navy shirt and slacks to work each day, ignored this and other demands, believing the Federation is not entitled to any money. His second-in-command, Julienne Bossé, took a stronger tack: She scribbled her response on a subpoena and faxed it back to the Federation. "F-?-?- you gang of A-holes," she wrote. "Ha! Ha! Ha! ... We will keep buying maple syrup forever." In another letter, she taunted the Federation for continuing to get the address of SK Export wrong and helpfully provided a creatively spelled alternative: "7348 Rue Funck You." When Bossé wasn't penning screeds to the Federation, she helped make syrup-filled chocolate maple leaves and melt-in-your-mouth maple meringues for sale in the gift shop. After the Federation reported the theft from the Strategic Reserve to the Québec provincial police, known as the Sûreté du Québec, the agency began a vast investigation that would involve interviews with nearly 300 people in the industry, reviews of export statistics, and forensic analyses of syrup kettles, forklifts, and scales, tracing two-thirds of the stolen syrup to companies in New Brunswick, Québec, Ontario, and the U.S.
At 10 a.m. on Sept. 25, Etienne St. Pierre was in his usual navy-blue outfit, working in the office after a recent scouting trip to China, when two police officers from the Sûreté du Québec arrived with a search warrant. Bossé knew their Québec warrant was no good in New Brunswick; at one point she says she pretended to wipe her derrière with it, gave the police the bird, and locked the side door. When the officers went to another door and asked for the keys to the warehouse, she snatched them from St. Pierre and tucked them into her ample bosom. The police relented, returning that evening at 11 with a stamp of approval from a New Brunswick judge, but they still had to pry open the warehouse door with a crowbar. Inside, St. Pierre had more than a million dollars' worth of syrup. The next day he told the authorities that about 700 to 800 barrels came from Richard Vallières, one of Québec's most notorious "barrel-rollers," an unauthorized middleman who had run afoul of the Federation in the past and paid thousands of dollars in fines. The police seized St. Pierre's forklift, his confidential list of suppliers, and all his syrup for forensic analysis. The next month they took between 75 and 100 barrels from an unmarked warehouse near Québec City that Vallières had rented to stash and cook fermented syrup. Neighbors said they frequently smelled the maple wafting across the parking lot, and Vallières made no attempt to hide his operation. In early November, I met Vallières in Kedgwick, where he was keeping a low profile, regularly lunching with St. Pierre and establishing his own sugarbush. A chubby, nervous guy in his 30s with a six o'clock shadow and a baseball cap, he was willing to speak only for a few minutes through the open window of his idling pickup truck. He owed back rent on the warehouse and hadn't returned to it since the raid. He said he typically bought from producers who had exceeded their quota but couldn't guarantee that purloined syrup didn't pass through his hands, and he had no idea who could have carried out the theft. Five weeks later, on Dec. 18, as snow blanketed the Saint-Lawrence Valley, the Sûreté du Québec arrested Vallières at his home near Québec City, charging him with conspiring with five others to commit the theft at the warehouse and sell the stolen maple syrup. TV cameras filmed him being hauled into the courthouse in handcuffs. One member of the gang had rented space in the same warehouse, merely moving the syrup from one section of the warehouse to another and out the other loading dock. In total, prosecutors have charged 22 suspects, including St. Pierre, who is accused of knowingly possessing and trafficking the stolen syrup. St. Pierre is out on bail and says he had nothing to do with the theft. The stolen syrup still worries law-abiding producers within the Federation. "My biggest fear is that this syrup is going to hit the market, and big buyers are not going to buy our syrup," says Turcotte. The Québec television station TVA Nouvelles reported that at least 70 truckloads of stolen syrup have already made it to three distributors in the U.S., including Bascom Maple Farms in New Hampshire, one of St. Pierre's clients and the largest maple supplier in the U.S. Bruce Bascom says he fully cooperated with the Sûreté du Québec and they have ended their inquiries, but he declined to answer whether the company purchased any stolen syrup. Two Vermont companies that reportedly purchased the syrup, Maple Grove Farms and Highland Sugarworks, did not respond to requests for interviews. There is no guarantee that the Federation will get its syrup back across international boundaries. "This is what bothers us," says Trépanier, a slim technocrat who is passionate about the Federation. "Everybody knows it is stolen, but nobody can do anything about it. It's incredible." At least until the full story comes out, he says the Federation is obligated to sell to Bascom and other companies that reportedly received stolen product. Large questions loom about whether Québec's tightly controlled system will survive in the long term. 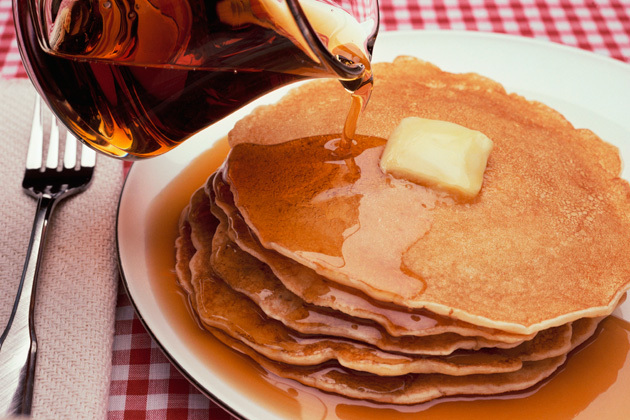 In 2002, the first year the new rules went into effect, Québec claimed 80 percent of world maple syrup production. The Federation has raised its quota from 68 million pounds to 115 million pounds today, but its market share is slipping. In 2011, its share dropped to 71 percent of the market as U.S. states and Canadian provinces without quotas have risen to supply cheaper syrup, according to buyers. Last June, Senator Charles Schumer (D-N.Y.) inserted the Maple TAP Act into the draft of the Farm Bill to provide grants to farmers to tap trees on private lands and to promote the industry. New York has 280 million tappable maple trees--three times more than Québec--but very few are tapped. The bill stalled in the House in September and may not pass until well into 2013. Trépanier is watching all these developments closely. "We are not idiots," he says, adding that in his mind climate change ultimately will tip the syrup scales in favor of his countrymen. On a recent afternoon, the side door to the warehouse where the theft took place was open, and a clanging sound echoed off the walls. It had a funk of spilled beer, and the floor glistened with patches of dried syrup. Two men with grimy work gloves climbed up stacks of battered barrels in the dark, knocked them down with a boom, and rolled them into the back of a trailer. "They're empty," said one of the men as he banged on the barrel. "Scrap!" Twenty-five miles away in the town of Laurrierville, the Federation was preparing its new warehouse. When the Sûreté du Québec called to say they had no place to store the syrup they seized from St. Pierre, Trépanier offered to help. "We have a new building," he said, "and there's some space in there." Borrell is a Bloomberg Businessweek contributor.